Y’all know at our house, us pups get a daily dental treat. My Lady says it helps keep our smile purdy WOOF! ‘Course we still have to see the lady in the white coat for checkups, but we love our daily chews! Bein’a dog, I’ve never really thought about how my cat friends kept their pearly whites shinin’. 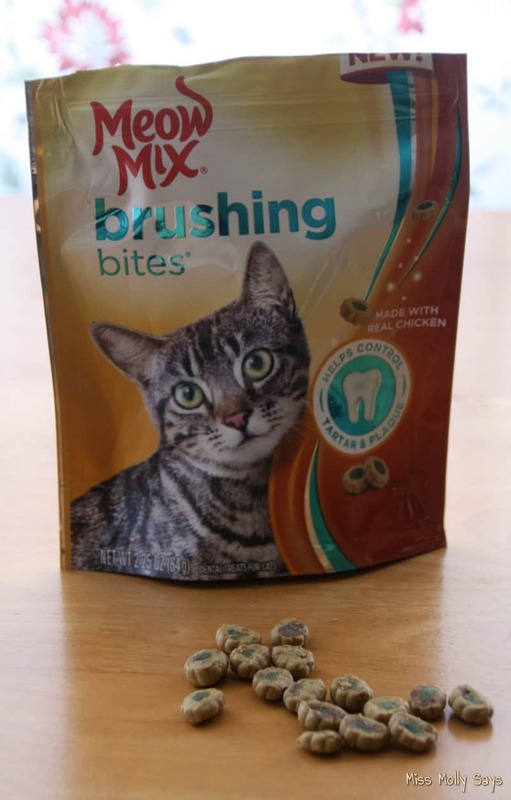 Well, the other day my cat friend Daisy was tellin’ me ’bout her new Meow Mix Brushing Bites treats! She was a tellin’ me how they help clean her teeth by helpin’ remove tartar and plaque. She also said they tasted mighty fine too. Anyways, I got to thinkin’ my other cat friends would like to know about em too! The secret to Daisy’s purdy smile is out of the bag now WOOF! I’ll let my Lady tell ya all about em! 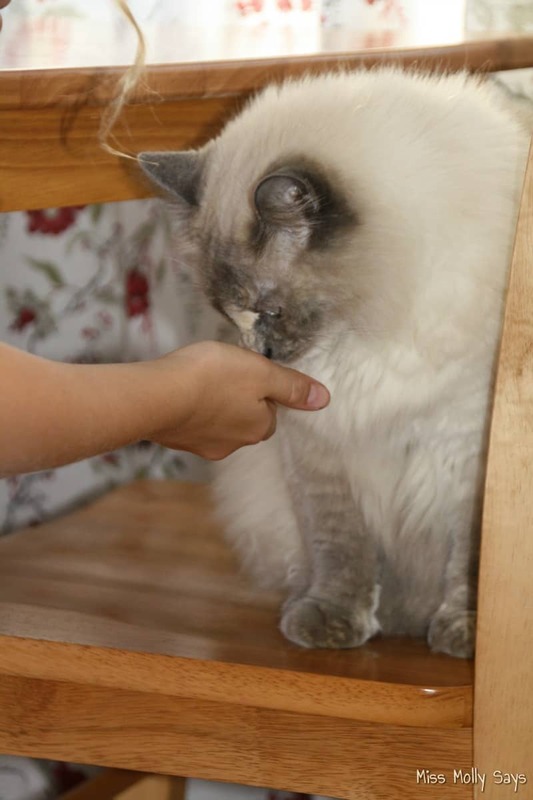 Did you know that 85% of cats can show signs of oral disease by as early as 3 years of age? And, as we all know, oral disease can contribute to more serious health problems. That’s where Meow Mix Brushing Bites can help! 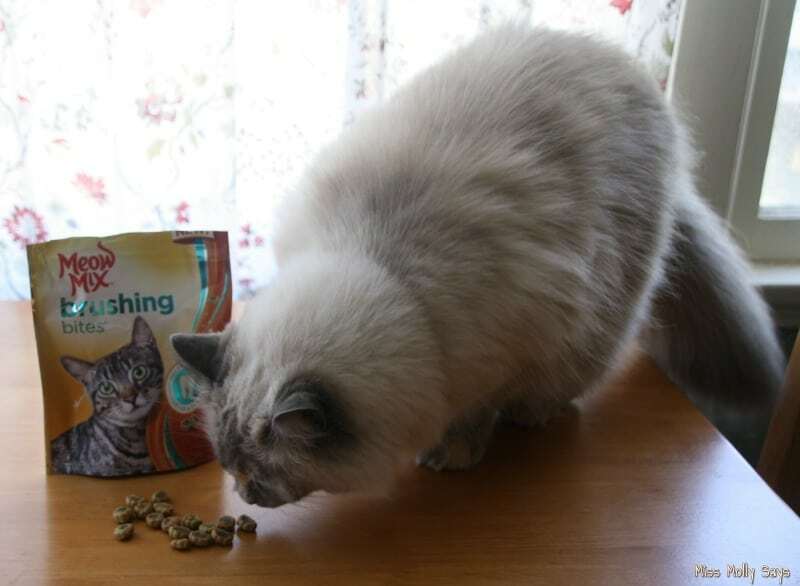 Meow Mix Brushing Bites are made with real chicken or salmon, giving them a delicious taste. They are also fortified with Vitamin D and calcium. These tasty treats not only help reduce plaque and tartar but also help in supporting strong teeth and bones. 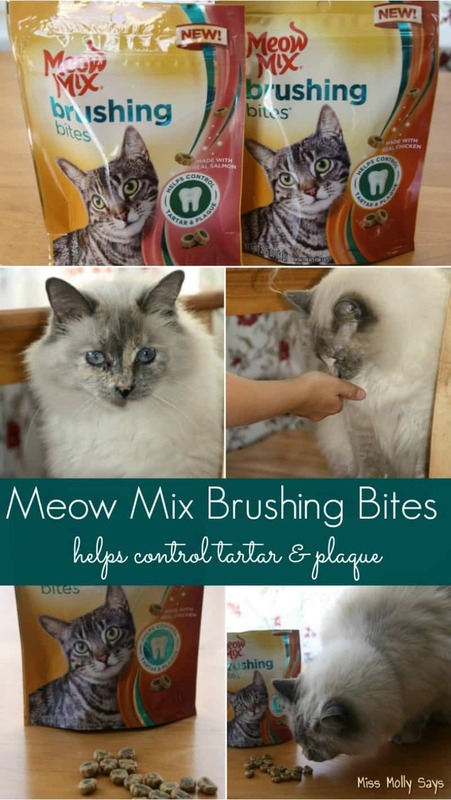 With the help of Meow Mix Brushing Bites, it’s never been easier to help control plaque and tartar for our feline friends! 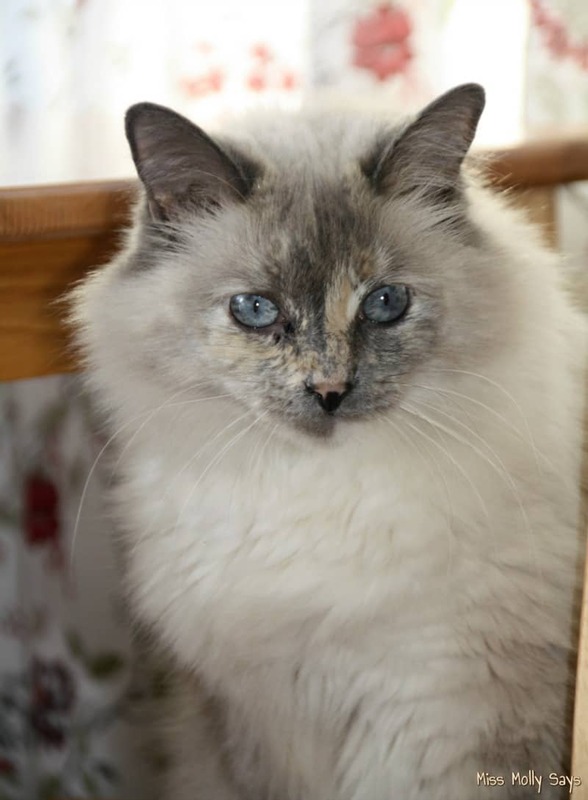 Our friend Daisy is one SERIOUSLY GORGEOUS kitty! You can get drawn right into those bright blue eyes! We want to do all we can to help her stay healthy, happy and beautiful. In order to do that, we have to think about her oral health. We want to be proactive when it comes to Daisy’s health and that includes her oral care. 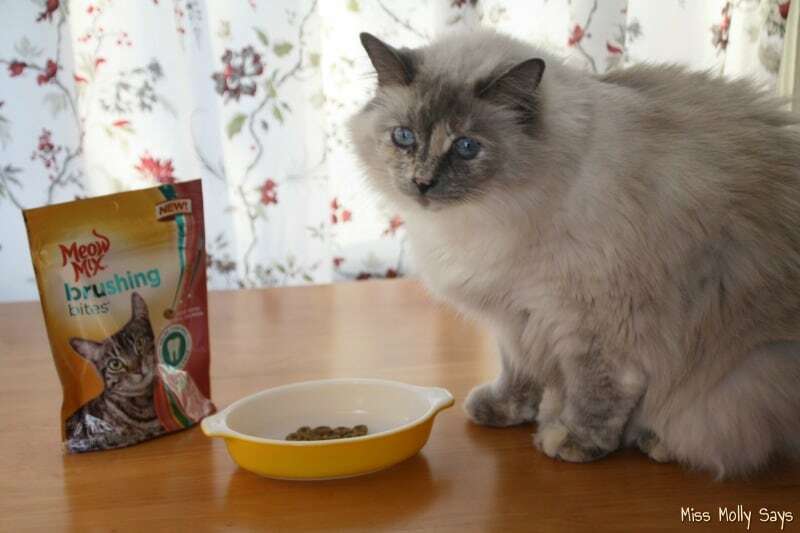 On our last visit to Walmart, we found the Meow Mix Brushing Bites in the cat food aisle and picked up the chicken and salmon flavors for Daisy. What does Daisy think of the Meow Mix Brushing Bites? Daisy has been ‘meowing’ about her new treats to anyone who will listen, including Miss Molly! While Daisy loves both flavors, her very favorite is the chicken! She loves those crunchy little tidbits! We love when we find a good-for-you treat that she loves! We also love knowing that the crunchy texture is helping clean her teeth! She is happy and, as a kitty mom, I am happy! Just opening the bag brings her running! If cats drooled, she may even be drooling. 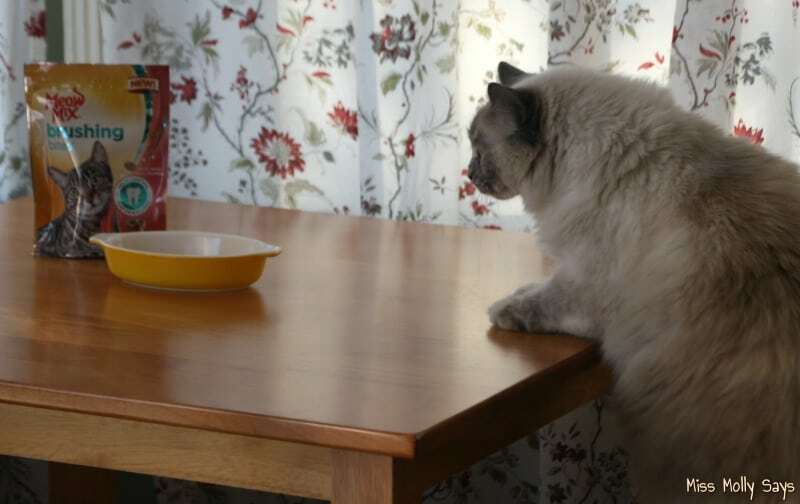 But, we all know cats are to proud to be caught drooling right? While Daisy doesn’t know they are good for her, or that they are helping keep her pearly whites clean, she does know a tasty treat bursting with flavor when she has one! 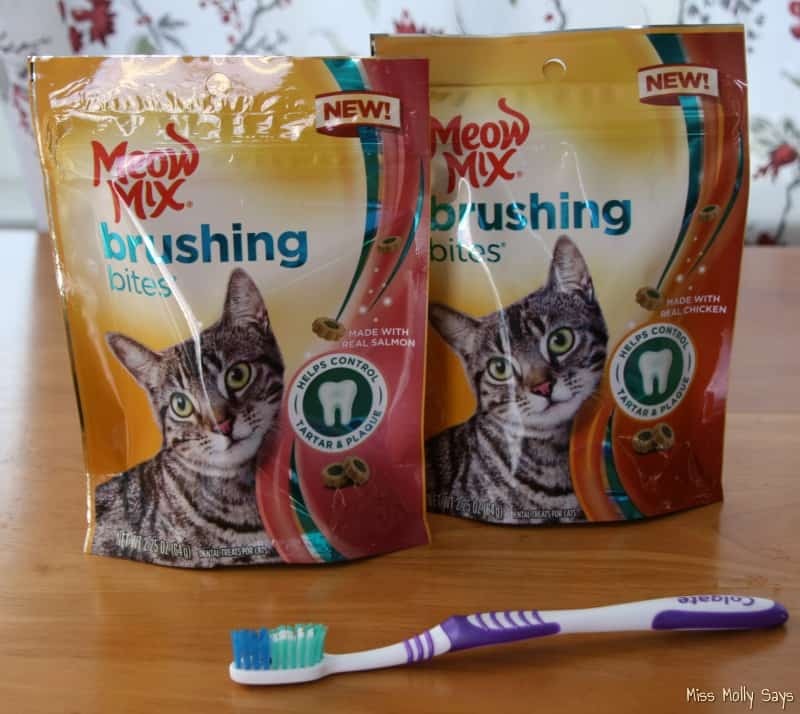 With Meow Mix Brushing Bites, it’s so easy to set a daily routine that will help keep her teeth clean. At night when brushing our teeth before bed, Daisy can enjoy a crunchy flavorful treat that will keep her smile bright! So, move over, and make room at the sink for two in the night time routine! Of course, all our feline friends still need regular checkups with their veterinarian. However, adding a tasty treat that can help clean their teeth can help them stay healthy and happy! Let’s keep those pearly whites nice and bright! Find the Tasty Meow Mix Brushing Bites at Walmart! Meow Mix Brushing Bites can be found at your local Walmart and will also be available on Walmart.com soon. The next time you visit Walmart, look for Meow Mix Brushing Bites in the cat food isle and treat your kitty! 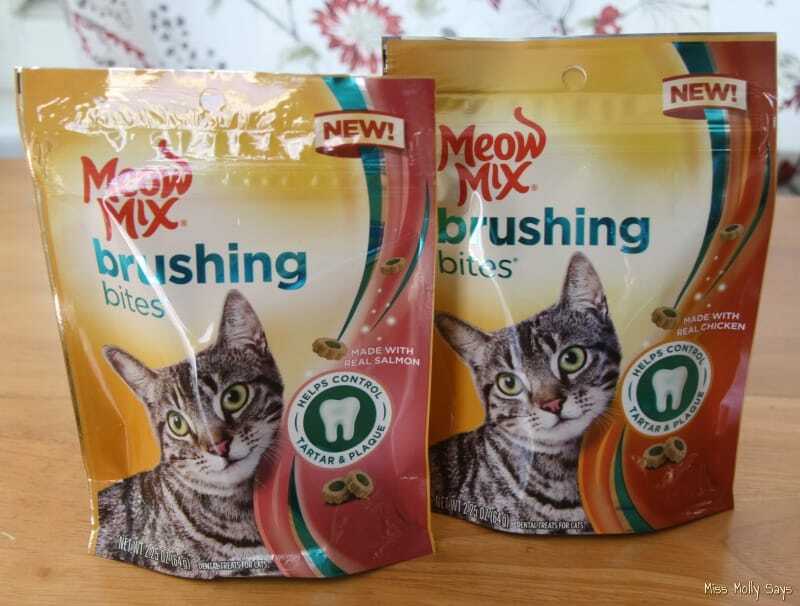 For now, you can find out more about Meow Mix Brushing Bites here.